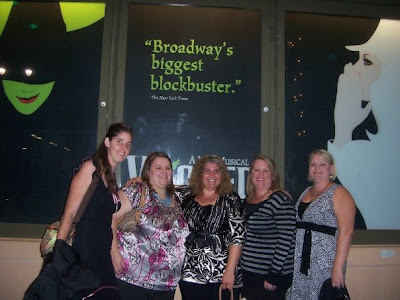 Last night we had a mom's night out and went to see Wicked at the Pantages in LA. I had such a great time. We carpooled up to Hollywood and Highland in the minivan. We had the CarBitch (Erin's navigation system) to help the navigation, but I think that may have confused me more. Dinner was at Twist. I spent more on alcohol than I did on food (what's up with $13 drinks??) but it was worth it. We were all a little tipsy by the time we left for the theater. Due to the amount of alcohol consumed and the height of my heels, I was all for the shuttle. The show was amazing. We had great seats. (Thanks Kathy!! :-) ) I would definitely go see it again. If you're not familiar with Wicked, it's based on a book, and it tells the other side of the story of the Wizard of Oz. So after the show, we took the shuttle back to the mall and headed home. We did learn that it takes a few mommy's to figure out how to open the doors on a minivan. I don't think they ever did figure out to work some of the seatbelts in the back of the van. LOL All in all it was a great night, and there was some talk of a weekend in Vegas. Now that would be fun!! I tried to read the book, but it was too odd. I heard the play is MUCH better. $13 a drink? Outrageous. I better only need one good solid drink for that price!